End of summer Etsy Sale. I just but a bunch of Etsy items up for sale, including Doc Martens, mod jewelry, 80’s New Wave pumps, 40’s Art Deco clutch purse, and more. Click HERE or on the 70’s strapless yellow calico sundress to check out the Sale section of my Etsy store. 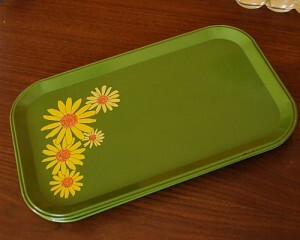 I love this blog, and I’m flattered that they featured my 60’s metal Daisy trays. Check out my Etsy store for more cool vintage housewares. 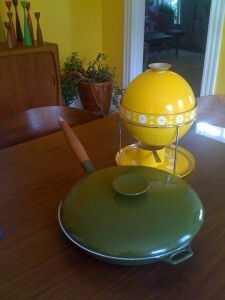 Danish Modern Enamelware. Just one more obsession. I like to think that Mr. NSV have the fondue type of lifestyle. However, we’re more the stir-fry and omelets type (though we do own a white shag rug carpet). So the avocado green enamel pan stays. The crazy sputnik shaped Cathrineholm fondue set is up for auction now. 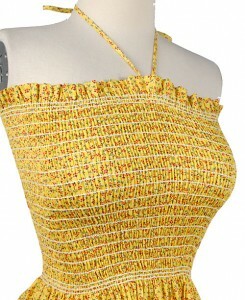 You are currently viewing the archives for August, 2010 at NorthStar Vintage.